I should post Halloween pictures. Because I'm so late, I'll just put the pics. The boys were so cute as the Three Musketeers. The day before we went to main street for trick or treating. The boys won first place in the costume contest. Then we went to the Great Wolf Lodge again for their Halloween party. I'm glad the boys we preoccupied with the water park because they only ended up with about 5 pieces of candy. They spent two days playing in the water. Hope everyone had a wonderful Halloween and Thanksgiving and maybe I'll get some Christmas pictures up before Easter! Since it is almost half way through November I will go ahead and post our Halloween pictures. (sorry you had to way so long Dad!) I think I'm going to have to do these in two posts. I can't narrow down the pictures enough! And I forgot about loading the pictures in reverse order so read from the bottom up. The second tractor hooking up to our tractor to pull us out of the mud. It has been a very wet season for us. Ok, I need to update. We have been busy around here, but what else is new. I can't believe it is already October! It will be Halloween soon. It has even felt like fall here for a few days. Fall is my favorite season. Too bad we don't get more of it. Camden lost his first tooth. He was worried because "everyone" else had already lost one. Now it is, "Everyone has an Ipod, Mom!" Well, sorry. You're 6. Last night we went to the police station open house. The boys love it. The police station and fire station have open houses every year for kids to come and see all the equipment and meet the policemen/firemen. They had face painting. Zachary chose a skull. Out of all the cute examples, he chose a skull. Jackson wanted a puppy. Camden got a police car on his hand. He didn't want his face to get "dirty". Zachary wearing the Swat jacket. It weighed more than he did so he had to have help. Zachary driving a police car. and driving a police car. Camden could wear it by himself. When he got in the car, he got in the back first. The policeman said the front was the better career. We love going to Legacy concerts. There is nothing better than sitting listening to them sing rocking my nephew. Jackson also loves to hold "his" baby. 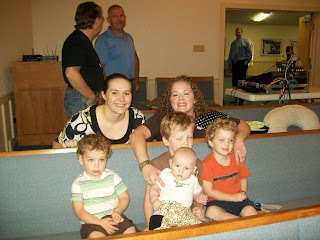 Sisters-in-law and cousins. I always catch Camden mid-blink. Today is also my Daddy's birthday. Happy Birthday Dad! Wish you were here! He lives in Germany so we don't get to see him very often. Have a wonderful day!!! Hope everyone has a wonderful October and hopefully I will update again before Christmas. I have been meaning to give each of these their own post but now know that is not going to happen so I'll just put them all together. Jackson was two on June 7 and we went to the park for an evening birthday party. It was actually pretty nice for June. The boys love this park because they can play on the playground, play in the water and play soccer. We also have enjoyed our fair share of lake time this summer. They boys are huge water babies. There is a restaurant on the lake we love and eat at regularly. Jackson really like the live music this night. None of our boys are are shy and never meet a stranger. He came right up to her and she picked him up and set him on her lap to sing. Zachary does not like this life jacket. Hope everyone is enjoying their summer! We are ready for school to start and to get back on a schedule! 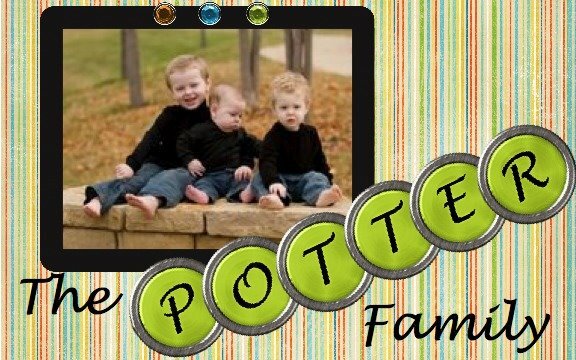 I am a stay at home mom of three beautiful boys - Camden, Zachary, and Jackson. I have a wonderful husband,Justin, and we have been married since June of 2001. We have blessed beyond our dreams in the last 8 years.